While there are a lot of spiritual books and articles that refer to "chakras," there are also a lot of readers who aren't sure what the term means. 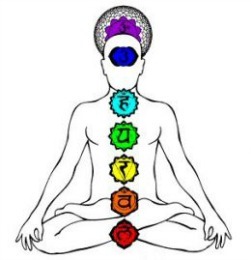 The word "chakra" comes from the Sanskrit word for wheel. The term symbolizes the energy vortices that run along our spines, through which life force energy is channeled from the non-physical into the physical dimension. The nature of everything in the Universe is energy, and the densest or slowest form of this energy (so far as we can perceive) is what we experience with our physical senses. There is a great deal of energy, however, that exists but can not be perceived physically. People with extrasensory perception, however, are able to perceive some of the energy that is in the process of slowing to a rate that can be perceived with physical senses. Picture it like this: before it rains, humidity is building in the atmosphere. We can't see that humidity as water, nevertheless, it is there. As it gets heavier and heavier, we may "feel" or sense it, but we still can't see it until it builds to a point where it actually becomes mist or drops of rain. Someone who is very sensitive can feel that humidity building before others can, and can "see" it in the air, so to speak, when others can not. This is sort of what happens with energy. We all have physical bodies that can be seen, felt, etc., but we also have etheric bodies, which are composed of our energy that is in the process of flowing into the physical dimension. Someone who is very sensitive can see and feel these energies where others can not. These people report what they perceive in terms of our "auras," and from them we have learned about the energy vortices called the chakras. Please note that sensitives the world over report on the existence of the chakras - be they Buddhist, Christian, Jewish, etc. - so this is clearly a universal truth. Our bodies are in a state of constant change. In fact, the nature of life itself is the flowing of energy. When energy stops flowing from the non-physical into the physical, we are "dead." Our non-physical aspects aren't dead, of course - just our physical bodies. Life force no longer flow this far. In people of great youth and vitality, the chakras and the aura tend to look brighter and more vibrant. In people of ill health - who lack "energy" - the aura will look more dim, and the chakras less vibrant. As we develop spiritually, our chakras grow and expand. In someone undeveloped, they may look like dim, small circles. In someone of great spiritual development, they will appear huge, vibrant, open and swirling. The "halo" of angels, Jesus and the Buddha are crown chakras that are so developed, even the common man could see them. The crown chakra, of course, governs our connection to Spirit - to all that is. Thus those of tremendous spiritual development are seen to have "halos" around their heads - rings of light. As the chakras of every person are unique, there is a wide range of possible manifestations here. Even within the same individual, some chakras will be seen to be highly developed, while others less so. Some chakras may appear to be clear, open and "healthy," while in others, problems or issues may appear like rips or tears, blocks, clouds, shadows, etc. Somewhere along the way, I picked up the idea of the chakras being divided into three classifications. The lowest are the physical, the middle the personal, and the higher the spiritual. There are no clear demarcations, however, so one level flows into the next. The more evolved we become spiritually, the higher we tend to be centered in terms of our chakras. In our modern world, we can see a shift from the hard work of the solar plexus from a few centuries past to the intense intellectual focus of the last century or so. Beyond the intellect of course lies Spirit; that is where we are heading as a race right now. Of course, it is never wise to focus solely on one aspect of life, or to be centered in one chakra; the ideal is to develop all chakras so that they are radiant, open, and in healthy balance with each other. As we progress or evolve on one level then, we must bring the other areas of our being up to speed. Thus someone who focuses a great deal on intellectual development (fifth and sixth chakras) tends to neglect other aspects, such as the physical - and gets "out of shape." Someone who is very spiritually focused, who meditates alot, etc. can "lose touch" with their physical being and the physical world. We say that they are "out there," by which we mean that they are not "all here" - grounded in their physical bodies. 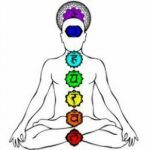 In my experience, it is thus important to assess the state of the chakras at any particular time, and if one or more seems to be lagging behind the others in development, or to reflect any sort of problem or issue, to work on bringing the corresponding area of one's life up to speed. I did this myself years ago. I began to explore spiritual matters constantly, and to meditate a lot, and through various experiences, in time figured out that I had developed my upper chakras (intellect and spirit) beyond my lower chakras (physical being and will). I then made a conscious decision to bring this into alignment by adopting more earthy, physical spiritual practices. Yoga is a great method for bringing spiritual energy through all of one's being, into the physical. It's a great way to balance all of your energies. We have a great Chakra Clearing and Charging Meditation available right here at Kajama.